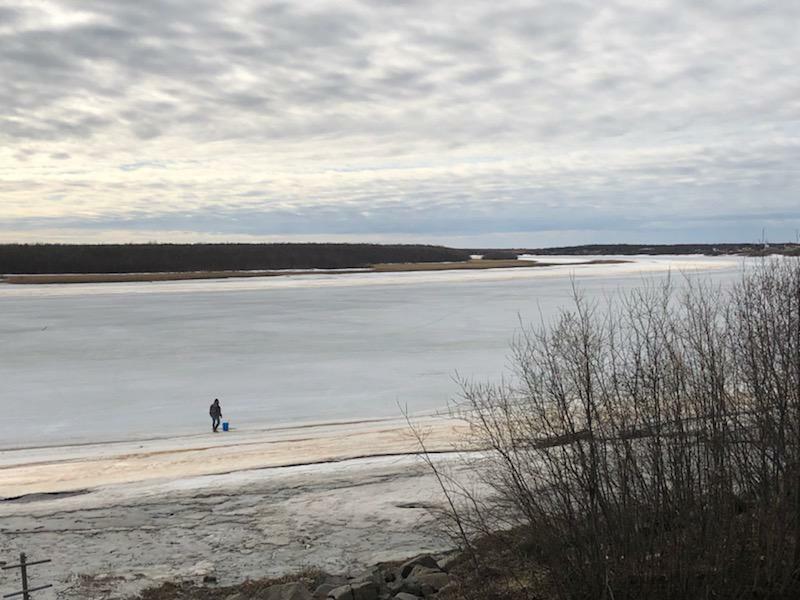 Two four-wheelers carrying five men leaving Bethel broke through needle ice on the upper end of Church Slough on Sunday night. Two of the men died, while three others were treated for hypothermia in Bethel. Alcohol played a role. Mark Leary with Bethel Search and Rescue was one of two people on the scene. “I looked across the river. I said, ‘Charles look. Look over there.’ He got his binoculars. It was people on the ice in the very area that we had been warning people to stay away from,” Leary said. Leary and another volunteer, Charles Guest, were told not to do anything because a helicopter was supposed to come, but it never did. Leary and Guest decided to go out anyway and not wait for the helicopter. While they were out on the ice they were joined by others. “We had to go upstream some distance to find a place that was marginally safe to cross. We made it across, but we broke through. We made it to the beach; we followed the beach down. Another snowmachine from Akiachak saw us,” Leary said. Leary had brought a long pole with a hook at the end, called a pike pole, to distribute his weight on the ice. He crawled out first, tethered to a safety line, with Guest behind him and the snowmachiner from Akiachak holding the rope. “It was confusing, so no sign of what you would expect to see four-wheelers breaking through the ice. There were no big holes or anything. There was just one unconscious man laying out on the ice, another one kneeling on the ice holding something in the water,” Leary said. They managed to get to the two men on the ice, one of whom held the body of partially submerged man who had succumbed to hypothermia. Then, using the pike pole, they pulled out one body. A fifth man had ended up walking away from the scene, where BSAR volunteer Earl Samuelson spotted him from his plane a mile away. Leary said that they couldn’t bring back the two bodies, so they laid those on a bank and tied their feet to a tree to make sure they could recover them if the water rose. “We put a space blanket over them, prayed for them, and left them,” Leary said. Leary says that they plan to head out today to recover those bodies and bring them back to Bethel. And he says that all winter travel should stop because the ice is too thin and dangerous to support a snowmachine, four-wheeler, or even rescue personnel. He says that this ice surprised the volunteers, who have never witnessed needle-ice or rock-ice this early in the season. People aren’t the only victims. KYUK was sent a picture of a moose that had broken through and died in Straight Slough. Alaska State Troopers and BSAR say to “stay off and stay safe.” KYUK also received information that the river ice is going out at Nikolai. Previous articleIs Alaska ready for its next health emergency?